Email is Microsoft Outlook’s most popular feature. Some people don’t know Outlook can do anything but exchange email messages. It’s a good thing that Outlook makes it so easy to read your email, although it’s too bad so many people stop there. When you start Microsoft Outlook, you normally see a screen with three columns. The leftmost column is the Folder pane, which lets you switch between different modules in Outlook to perform different tasks. The second column from the left is your list of messages; the right column (called the Reading pane) contains the text of one of those messages. If the message is short enough, you may see its entire text in the Reading pane, as shown here. If the message is longer, you’ll have to open it, or scroll down in the Reading pane, to see the whole thing. A received message in the Inbox. Click the Mail button in the Navigation bar to make sure you are in the Mail module. You don’t need this step if you can already see your messages. Double-click the title of a message. Now you can see the entire message on its own window. A quick way to skim the messages in your Inbox is to click a message and then press the ↑ or ↓ key. You can move through your message list as you read the text of your messages in the Reading pane. If you feel overwhelmed by the number of email messages you get each day, you’re not alone. Billions and billions of email messages fly around the Internet each day, and lots of people are feeling buried in messages. Anytime you’re reading an email message in Outlook, buttons labeled Reply and Reply All appear somewhere near the top of the screen. That’s a hint. In the Mail module, select the message to which you want to reply. Click the Reply button on the Home tab of the Ribbon. If you’re reading a message sent to several people besides you, you have the option of sending a reply to everyone involved by clicking the Reply All button. Some people get carried away with the Reply All button and live to regret it. If you get a message addressed to lots of other people and click the Reply All button to fire back a snide response, you could instantly offend dozens of clients, bosses, or other bigwigs. Use Reply All when you need it, but make sure you really know who’s getting your message before you click the Send button. When you reply to a message, by default, Outlook includes the text of the message that was sent to you. Some people like to include original text in their replies, but some don’t. In Chapter 5, I show you how to change what Outlook automatically includes in replies. At its easiest, the process of creating a new email message in Outlook is ridiculously simple. Even a child can do it. But if you can’t get a child to create a new email message for you, you can do it yourself. In the Mail module, click the New Email button on the Home tab of the Ribbon. The New Message form opens. 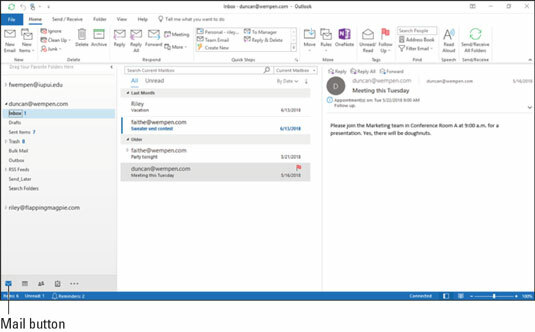 To make sure you are in the Mail module, click Mail in the Navigation bar in the lower-left corner of the Outlook screen. Fill out the New Message form. Put the recipient’s address in the To box, type a subject in the Subject box, and type a message in the main message box. Click the Send button. Your message is on its way! If you want to send a plain email message, these steps are all you have to do. If you prefer to send a fancier email, Outlook provides the bells and whistles — some of which are actually useful. For example, you might send a High Priority message to impress some big shots or send a Confidential message about a hush-hush topic.